This is what happens when you spend the day hanging out with your quilting buddies....enablers the whole lot of them. 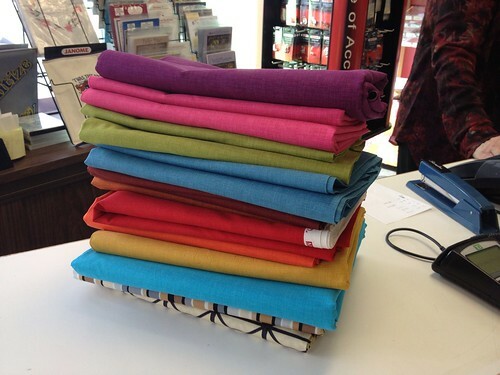 Note: The lovely coloured solids are "Quilter's Linen" by Robert Kaufman. They are not an actual linen....they just have a linen look. I have a large supply of neutrals in these, which I have used a fair bit and love working with them. They are yummy! Can't wait to see what you do with yhem. I can't wait to cut into them, I love working with these fabrics. Danke für das Link. Sehr interessant!! I love linen - is it really linen or cotton just printed to look like linen? The colors are fantastic! I will be headed to a quilt shop for our monthly modern quilt guild meeting ont eh 24th of April and it could be dangerous to my wallet! I may be the only quilter out here who hasn't worked with linens yet. What brand are they? Let us know how you like them. Just got my copy of Modern Patchwork and saw your quilt in an article about the Blogger's Quilt Festival. Still one of my personal favorites, although this new one with the circles is pretty amazing.